Help us reach 5000 Fans on Facebook! When I first grabbed the Babykicks Bumboo Pocket, I was intrigued. It had a couple features that I'd never encountered before in a pocket diaper. One thing I immediately noticed was that it was incredibly trim. It comes with a Joey Bunz insert, which I found to be very absorbent. I didn't think it would hold up to my little guy's intense heavy wetting, but it did the job! 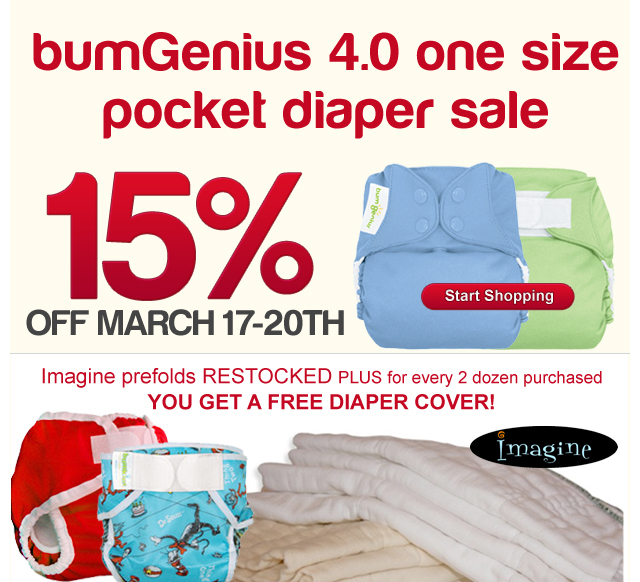 The main feature that separates this diaper from other pockets is the "air gussets." They are made out of a fleece material that allows better airflow and helps prevent rashes because they contain no PUL. I was worried that they would mean seeping out the legs, but amazingly enough there was no leaking. The soft gussets also mean no red marks around little legs! The 3g version made some improvements over the last style -- and the thinner sides really made a difference to accommodate my big baby's thighs. Overall, I was very impressed with a diaper I didn't think I'd like. Was $15.50 SALE $14.25 FREE SHIPPING! Item of the Week runs Wednesday through the following Wednesday Wednesday is DOUBLE DEAL DAY with overlapping Items of the Week! Help us reach 5000 Fans on Facebook! We're less that 150 "Likes" away! Once we hit 5000, we'll randomly choose a winner of a Planet Wise Snack Pack! 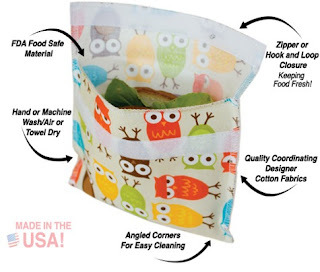 You pick a Sandwich Wrap, Window Bag and Snack Bag in your choice of prints. To enter, head on over to our FB page and if you don't already, "Like" us and leave a comment on the giveaway thread!